The Hubby's first blog recipe, and of course it's one for the BBQ. My apologies to my Canadian readers who don't live on the west coast, but out here it's barbeque season all year long baby! 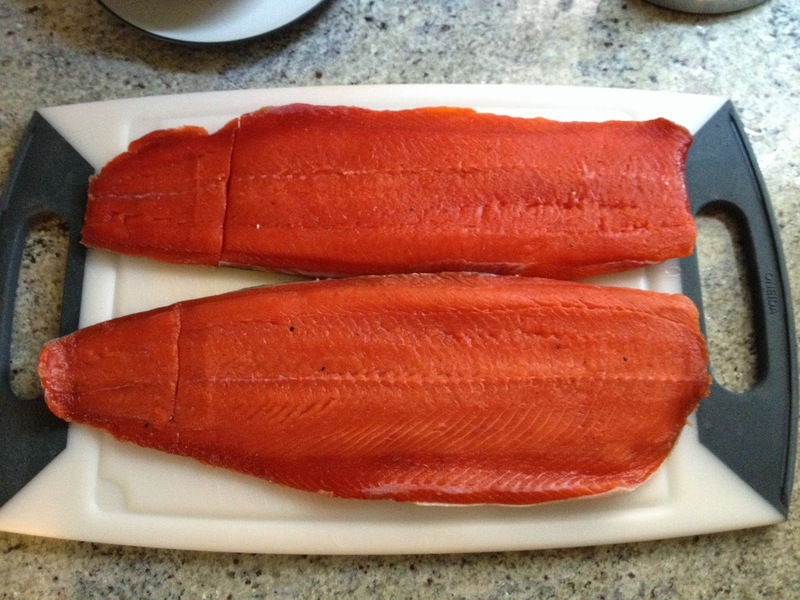 Hubs has made this to-die-for smoked salmon for New Years Eve every year for the past two years (so, twice), since his parents bought him the smokebox accessory for our Weber BBQ. He stresses and fusses and toils over it as though it were his baby. "I think this will be my best smoked salmon attempt yet!" "This is going to be a total fail!" "It's not getting enough smoke!" *he has just informed me that he has never actually said this last one. In the end it's always perfect. This year he made a double-batch because I accidentally bought double the amount of salmon that I was supposed to. That works just fine for me because now we will have super flavourful smoked salmon in our freezer for a quick appy. Speaking of quick appy, this one takes over a day to prepare in its entirety, so make sure to plan ahead. You will need some hardwood chips to smoke the salmon. The Hubby's preference is hickory. We choose to serve it with bagel chips, cream cheese, and capers. This is a crowd pleaser and he always gets rave reviews! To prepare the rub, mix together the salt, brown sugar, white sugar, and pepper in a medium bowl. Spread a piece of extra-wide aluminum foil a little longer than the length of the salmon along the counter, then top with an equally-long layer of plastic wrap. Sprinkle 1/3 of the rub onto the plastic. Lay one side of the fish skin down onto the rub, then sprinkle 1/3 of the rub onto the flesh of the salmon. Place your second piece of salmon flesh-down onto the first piece of salmon. Use the remaining rub to cover the skin on top of the second piece. Fold the plastic over the salmon to cover it completely, then close the edges of the foil together and seal tightly around the salmon. Place the wrapped fish onto a rimmed baking sheet, and top with another baking sheet. The rimmed edges are important because lots of juice (salmon juice??) leaks out during the marination process, and you need something that will collect the run-off. Weigh down with something heavy, such as a phone book, heavy cookbook, or a brick. Refrigerate for 12 hours. Flip over the salmon, then refrigerate again for another 12 hours. Unwrap the salmon and rinse well with cold water to wash off the rub. Pat the salmon dry with paper towels, then place in a cool place (not the fridge) until the salmon is dry, about 1 - 3 hours. Now you are ready to start smokin'!!! Set your BBQ's smokebox attachment or a smoker to between 150 - 160 degrees F, and start smoking your fish over hardwood chips such as hickory. Keep smoking away until the thickest part of the fish registers at 150 degrees F. After that, you can serve right away (or chill and serve), or keep it for later in the fridge for up to 3 days. We choose to serve with cream cheese, capers, and bagel chips. Recipe Source: Alton Brown's Good Eats - Where There's Smoke There's Fish!